Langtang Valley Health - Rous Unplugged - A little bit of Magic! Brigid Kramer from Awesome Voices choir is on the management committee of an Australian based charity called Langtang Valley Health. In 2012, Brigid's friend Virginia (a nurse), while treking in Nepal was asked to help set up a health clinic. The area of the clinic was the Langtang Village, an 8 hour drive and 3 day walk from Kathmandu. The clinic opened in 2013 and employed 2 nurses. Vaccination programs were underway and public health initiatives were established. The community was thriving with this infrastructure. Unfortunately, the first earthquake in Nepal shattered the mountains above our village and our whole village was destroyed. Our staff did not survive and most of the villagers died. As our clinic was the central focus of villages around because of the clinic, the people from surrounding areas have turned to Langtang Valley Health for help. The Langtang Valley is still unsafe and the locals are displaced currently in Kathmandu. The people want to return to the valley and resume their lives. Their ancestry goes back in the valley for 400 years and their traditions are strong. Langtang Valley Health stands by their people, currently feeding and housing them in tents while the next phase of return to the valley is progressed. As this charity is already known to the people from Langtang Valley, they have been trusted with continuing involvement with this displaced community and they are seeking your help. The choir of Awesome Voices will join a great line-up and perform at Rous Unplugged on Friday, May 29, in support of this charity. By now all of you will have heard the news and we continue to share the grief of the Nepalese community at this terrible tragedy. It is with even more sadness that we confirm the media reports that our small community has been completely devastated. Words are inadequate to express our feelings for all those many people who have lost friends and family, homes and businesses. We are so sad to report that Langtang village has gone, our clinic is gone, our staff are gone and there were only seven survivors from the avalanche that destroyed the village and everything in it. Our hearts go out to the families of all those who lost their lives. Our grateful thanks go to all those generous people from countries all around the world, who have donated to our earthquake relief fund. As at 19th May 2015 our appeal has raised $45,798.08. Many people have asked us what their donations will provide. At this point in time all funds are being used and will continue to be used to provide short term disaster relief to members of the Langtang community. · If you are considering making a donation via EFT please let us know so that we can email you a thank you letter and your receipt. We will only add you to our data base if you give us permission to do so – if you want to continue to receive our newsletters and have not done so already contact us. · If you know of friends who have made donations and you think they would like an update please forward them this email. · Receipts will be sent out in the middle of June. Langtang village has been completely destroyed. Moments after the earthquake struck, a massive expanse of ice fell thousands of metres from Langtang Lirung, the 7227m mountain above the village, creating an avalanche that wiped out a community where 400 people lived and where, at that moment, nearly 100 foreign trekkers are believed to have been. The ruins of a lodge sheltered under the rock wall is all that remains of the village. The massive hanging glacier cracked when the earthquake struck at 11.56am. The ice formed a cloud that gathered snow and rocks and then funnelled down the mountain, burying the village, and creating an enormous pressurised blast which devastated Kanjen, a village 2 – 3 hours walk above Langtang. All villages and settlements leading up to Langtang village have also been extensively damaged not so much by the earthquake but by the avalanche that travelled up the valley to Kanjen and also up the opposite side of the mountain. No one knows exactly how many people are still missing in the area, but it is estimated that 183 Nepalese and 50-70 foreigners have died, and at least 100 people, both foreign and Nepalese, are still unaccounted for. Those that have lost their lives include our beautiful, gentle nurses, Sonam and Chandrika, and Dawa, our landlady who was one of the most special people on this planet. 11 children about to start nursery school at the newly reopened Community Action Nepal (CAN) school all died. 8 were in the newly opened hostel ready for their first day at school. There were seven survivors from the village who were absent at the time of the quake. One family of survivors included a two year old boy with two broken legs. They had to wait three days for a helicopter. Some people remained in Kanjen including Tshering Pema Tamang, our President of KGLS for three weeks after the earthquake to perform burials. Our hearts go out to those who were there until several days ago. 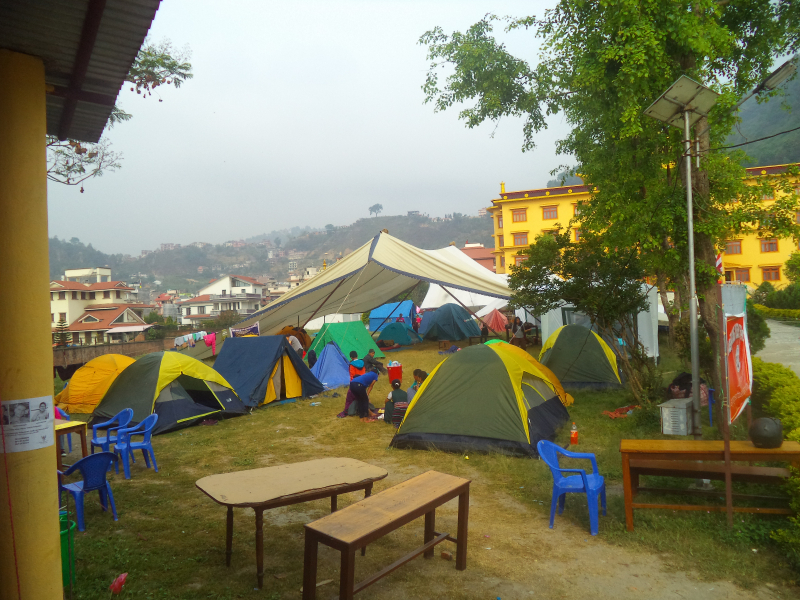 · Around 400 people are now ‘camped’ at the Yellow Gomba (Monastery) in Kathmandu. This is where our relief supplies are being directed. · Lodge owners have lost their livelihood and the ability to repay loans for now destroyed lodges and houses in Kathmandu. 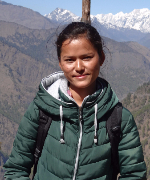 · Five children at boarding school in Kathmandu lost their parents. They are being supported by a German organisation, Sano Madat, who sponsor the education of many children from the region. · Our displaced community are dealing with poverty, trauma, grief, illness, injury, fear of the unknown, continued tremors…and the list could fill this newsletter. LVH has worked hard to facilitate coordination of relief efforts and is now working closely with an organisation established after the earthquake called Rasuwa Relief (currently now working with the Dolma Development fund). Both organisations have a long history of working in the Rasuwa district where Langtang is located and are ideally placed to coordinate relief work and guide organisations like us who are not on the ground. Working collaboratively is the only way to approach this task. Our Project Manager Pemba has been purchasing and distributing relief supplies; supporting the families of our nurses and the Langtang community as best he can; was involved in organisation of the repatriation of our volunteer doctor Erin and her partner Ben, who had left Langtang the day before the earthquake and are finally safe in Australia. We have commenced a database of people at the Yellow Gomba so that our aid efforts are well directed. Our Trustee Geoff left for Nepal with Australian Himalayan Foundation (AHF) and is still there. Our founding Trustee Virginia has worked tirelessly within this chaos. · Two financial instalments have been sent to Nepal to purchase food, water, tents, essential medications, tarps, toiletries, handwash and these are all being distributed as needed. · We are facilitating cooperation with Rasuwa Relief and the Dolma Development Fund so that we can all achieve a more structured, organised, efficient, provision of needs assessment and relief. · We contacted the Scheer Memorial Hospital in Banepa who Virginia has wonderful links with. They were and still are willing to be a referral centre for any injured patients from Langtang should they require it. This offer is available for as long as it is needed. 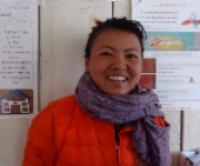 · We contacted existing organisations who are helping the Langtang region in other ways, for example Sano Madat, who with Community Action Nepal, had arranged for the school to reopen with a nursery class week or so after the earthquake. They are also taking care of some of the orphans who were at boarding school in Kathmandu and survived the quake, whilst their parents in Langtang didn’t. · We are working to facilitate and encourage the sponsorship of children through organisations rather than privately. Individual arrangements fail when sponsors cannot continue their commitments. An organisation can find a new sponsor quickly so interruption to that child’s education is avoided. · A formal condolence letter has been sent to the families of both Sonam and Chandrika, and you will find on our Facebook page a photographic tribute to each of our nurses and one to Dawa, our beautiful landlady who mothered everyone and was so dear to all who knew her. Our Management Committee member Brigid has done the most amazing job setting up links with other organisations providing relief and most importantly, passing on the details people that were looking for their loved ones. She has also been instrumental in obtaining a lot of media coverage for us in Australia and has been a wonderful support for Virginia. Our first volunteer doctor Mike from the UK has been doing radio interviews in the UK and has been a huge support for Virginia and Pemba. His special relationship with the community has been invaluable. Our Management Committee Member Krishna has done an outstanding job of working with the Nepalese community in Canberra to raise over $40,000 for relief supplies for other areas of Nepal. The aim of LVH was to provide primary health and emergency medical care to residents of and visitors to the Langtang community and we did this well. The clinic was established for the local community with the aim that income from trekkers would eventually make the project sustainable. We were achieving all we set out to achieve. Our immediate concern is with disaster relief and when the disaster phase of this tragedy is over, decisions will no doubt be made by the Langtang community about what happens next. We do not know how many of the survivors of the earthquake will return to Langtang. Nor do we know whether they will rebuild, how they will rebuild or how long it will take. We are receiving emails asking or assuming that we are going to ‘rebuild Langtang’ and do other things that do not come within our mission statement. We are a tiny organisation with no expertise in such a massive undertaking, and we could never raise the amount of funds needed to do so. · All of you wonderfully generous people who have made donations to our earthquake relief fund. · The Australian Himalayan Foundation for your donation of $3000 for disaster relief and to Tshering in Nepal for supporting Pemba. · ‘We Help Nepal’ for the donation of US$4000. · All those who have contacted us with emails of support, kindness, messages of encouragement and we are glad we could help some of you find missing loved ones. We wished there could have been more happy emails than sad ones. · Tshering Pema Tamang and all those members of the Langtang community who have remained in Kanjen to perform burial rituals for those that have passed away. · Dr Erin for volunteering for us, and we are so sorry your wonderful experience ended the way it did.